Materials: One 100% wool sweater (NOT machine-washable). 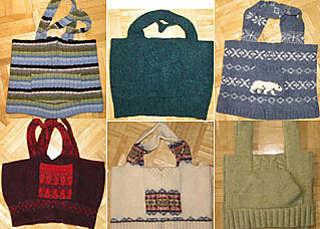 Totes shown made with adult Large sweaters. Notions: Sewing needle and thread or sewing machine, dressmaker’s chalk or quilter’s pencil, ruler, scissors, at least 36” long recycled leather belt, strap, or dog leash for handle (if making bag with leather handles). This pattern is also available for free.